CIS Arbitration Forum authors and other experts from the region teamed up to produce the first comprehensive overview of commercial arbitration in the Commonwealth of Independent States (CIS) region. 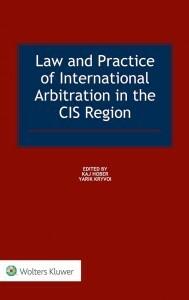 The Law and Practice of International Arbitration in the CIS Region edited by Kaj Hober and Yarik Kryvoi provides a country-by-country analysis of regulation and practice of international arbitration in ten CIS jurisdictions. CIS Arbitration Forum authors Dmitry Davydenko, Olena Perepelynska, Aliaksandr Danilevich co-authored the chapters on Russia, Ukraine and Belarus. This book examines notable developments in the use of arbitration mechanisms contained in bilateral and multilateral investment treaties affecting the region. The book can be ordered at Wolters Kluwer.